​ Arkansas natives James (J.D.) and Dora Cooper established an early farmstead here about 1900. In 1910 J. D. Cooper persuaded the county to create a school district for the community of Cooper which had developed in the area. Cooper School was built about 1910. Cooper Methodist Church, organized in 1913, held services in the school until a chapel was built about 1916. The chapel was relocated here in 1922 to a site near the newly-erected Cooper School building. 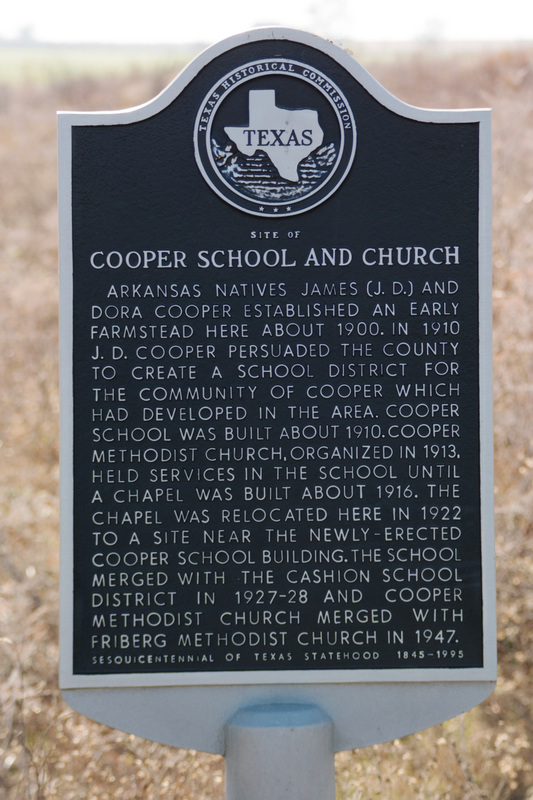 The school merged with the Cashion School District in 1927-28 and Cooper Methodist Church merged with Friberg Methodist Church in 1947. Located on Farm Road 1177, 0.6 miles east of Cooper Road. The marker is on a hill and on a curve. Use caution. GPS 34-degrees 02' 43.o" -98-degrees 27' 28.2".